Congratulations on assuming command of your ship. Your arrival is timely—a temporal anomaly is threatening the galaxy, and Starfleet needs its best commanders in peak form. Before you warp off to the farthest reaches of the galaxy, you may find it helpful to read this game guide, which gives you both the basics of gameplay, and a glimpse into the philosophy of the game and what may be coming down the road. Our development team is continually unveiling new features, each of which will help you experience one of these pillars of gameplay in a more evolved way. As such, STAR TREK TIMELINES will grow with our community of players, and you will continually experience a new and changing universe in which to play. To begin, check out this video, in which Executive Producer Rich Gallup plays through and discusses the first mission. In order to advance your crew and upgrade your fleet, you will need to acquire, build, or purchase items and upgrades by undertaking missions and completing gameplay. Alternately, players can obtain upgrades and materials by purchasing them in the Time Portal or Faction Centers. There are several types of expendable resources in the game. Credits: Federation credits are used to buy packs in the Time Portal (shop) and from Faction Centers. You earn credits by completing missions. Chronitons: Energy expended to undertake missions. Away Team Missions and Ship Battles have a chroniton cost listed on the “Energize” or “Enter Ship Battle” button. Chronitons recharge over time, or you can purchase additional with dilithium. Merits (not pictured, but visible on Faction Shuttle Mission Menu): A kind of token earned by completing Daily Missions. You can spend merits at a faction’s homeworld for faction-specific rewards. As your faction reputation increases you can earn better equipment, ship schematics, and transmissions for your shuttle teams. Dilithium: A rare material important for fueling warp technology. Dilithium may be exchanged at the Time Portal for a chance at rare crew, equipment, and starship schematics. Players wishing to take their advance through the game at warp speed can purchase dilithium. A breakdown of each feature found in the game menus. Swap your active starship using this screen. You can also see how many ship schematics you own and how many are required to build a new starship. Acquire starship schematics via the Time Portal, Faction Centers, by completing Away Missions and Starship Battles, and by climbing the Leaderboard in the Battle Arena. Here you will be able to compete against other players in ship-to-ship combat. See our Battle Arena post for detailed Battle Arena instructions. You can add or remove in-game friends and contacts via the Friends panel. Fleets are groups of fellow players that you can join up with. For now, Fleets are a place for you to chat about the game. As we continue to develop new features for STAR TREK TIMELINES, Fleets will become an essential part of of the gameplay experience. Your inventory. These are the items you have collected through your missions and salvage. They can be used to equip and level your characters or to build higher-level items. Communications from Disruptor Beam,, such as messages from Customer Support, notifications of in-game events, and more can be found here. Press this button to activate built-in screen recording on any iOS 9 device, and save some of your most impressive moments while playing STAR TREK TIMELINES. Adjust basic game settings via the Settings panel, such as game audio volume and your Disruptor Beam account login. Get in touch with Disruptor Beam’s dedicated support team using the Contact Support panel. Please note: we work extremely hard to make sure that you are able to experience fully immersive gameplay whenever you want. If at any time you experience a technical issue which keeps you from being able to access this menu, please open a ticket. Our dedicated support team will do everything possible to get you back into your ship as quickly as possible. Whenever an important piece of game info is available, a circle icon appears on the right side of your screen. Note the circle surrounding Captain Jean-Luc Picard on the right side of the screen. Sometimes there will be a character, like Captain Picard, who wants to speak with you. Tapping the icon brings up a dialog box with that character. When at the home world of one of the many factions in the game, you will be able to visit the Faction Center. Here, you can purchase Faction Transmissions (needed to undertake Shuttle Missions) and other faction-specific rewards. When viewing the Galaxy Map the Notification icon becomes an exclamation mark. When tapped, it will cycle through available missions. This screen gives you access to the Guardian of Forever, a living time portal capable of sending and receiving any person or object through space and time. Use the Time Portal to acquire new crew, equipment, and even schematics to build starships. You can also spin the Dabo Wheel for a random chance at equipment, starship schematics, and more. Check the Time Portal regularly, as you can find daily and weekly offers plus deals on ships, items, characters. Starfleet Command has designated an area of Federation space as a Battle Arena. Here, Captains can test their wits and their firepower against other players, rise up the Leaderboards, and earn valuable daily rewards. Visit our Battle Arena Blog Post for more information. A Faction represents one of the various political organizations, empires, federations, and groups from the galaxy and across all different universes. For example, the Klingon-Cardassian Alliance exists alongside the United Federation of Planets, the Terran Empire of the “Mirror, Mirror” universe, and the Cardassian Union. With all of the different factions, it’s no surprise many of them have frequent ideological and political disputes. As you become involved with various Factions through Episode storylines, you’ll need to decide which sides to favor. Completing missions for a faction may grant you increased reputation with it, unlocking new rewards you can purchase in that Faction’s Center. The Scan function of your starship allows for occasional daily scans to collect free salvage, which are items that can be used to progress your game in various ways. Rewards may include Faction Mission tokens and additional credits. In STAR TREK TIMELINES, you assemble a dream team from Star Trek™, including the original series, The Next Generation, Deep Space Nine, Voyager, and Enterprise. As a Captain, you’ll direct the action and choose crewmembers to tackle any given dangerous or tense situation. As a roleplaying game, STAR TREK TIMELINES features characters with Skills , Levels , and Equipment . However, members of your crew also have stats like Star Rating , Details , and level-cap advancement . Star Rating  reflects the rarity of a crew member in STAR TREK TIMELINES, which roughly equates to each of their skill’s total potential. More stars means overall higher stats in skills, like Enterprise-D Picard’s skills in Command, Diplomacy, and Science. Each crew member has four Equipment  slots. Giving your crew the appropriate Equipment will raise their Skills  and capabilities in both Away Missions and Starship Battles. Once all four equipment slots are full, a crew can be Advanced , which makes it possible to promote them ten additional levels and opens up four new equipment slots. By improving crew equipment, you’re able to increase their stats and overcome even more difficult challenges. Your Daily Missions reset once per day, and include currency and item rewards for simply playing STAR TREK TIMELINES. They’re also a good way to jump around game activities during quick play sessions. You can chat with other players, send private messages, or talk with your fleet from anywhere in the game. Making new friends and talking with other players is a great way to earn more rewards and even learn some tips and tricks. After a brief tutorial and advancing your captain a few levels, you will be able to choose your captain’s name and portrait. A small number of portraits are available to begin. It’s possible to earn a crew member’s portrait as your own Captain portrait by leveling-up that crew member. 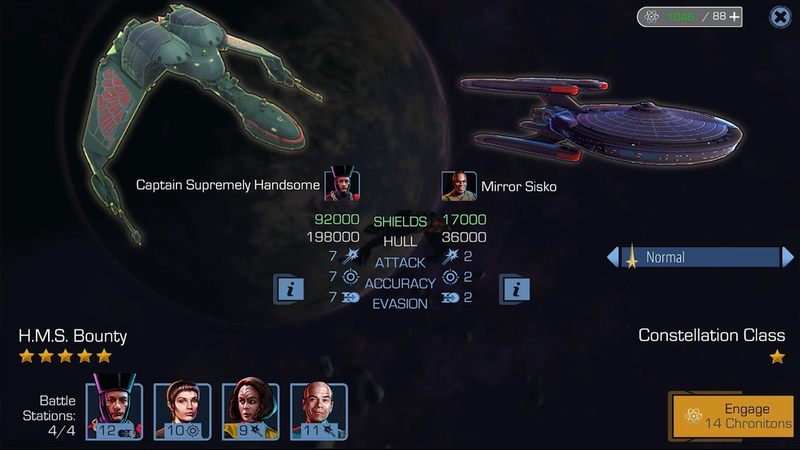 The main storyline of STAR TREK TIMELINES is explored by playing Episodes, which are a combination of Away Missions and Starship Battles. The first Episode, The Art of War, pits the Klingon Empire against the Augments as they settle a dispute for dominance. Later on, Episodes can feature factions like the Bajorans, Ferengi, and many more. Completing a whole Episode can result in significant Captain and crew experience, new equipment, and new crew members. Gain Captain experience by completing missions and rise in levels to unlock new game features. You’ll unlock new game features like additional Captain portraits, access to Fleets (player guilds), and additional battle stations for your starships. To get new crew and equipment, you can buy and spend dilithium as well as earn and spend credits. Almost everything in STAR TREK TIMELINES can be earned by spending credits on crew and item packs, but dilithium packs have a better chance of dropping rare items, crew, and starships schematics. Captains earn credits by completing conflicts, fighting in ship battles and completing shuttle missions. In addition, special “themed” packs have higher chances of dropping specific types of items — for instance, a Klingon or Romulan crew and item pack. You can also complete Episodes to earn new crew and equipment. If you conclude an Episode in favor of a particular faction, you can recruit a crew member associated with that faction, like Worf (Klingon) or Bones (Federation). Tea, Earl Grey, hot. From common to legendary rarity. Each new crew member joins your starship with one star, at level one, and with an starting level-cap of 10. So where does item rarity come in? Let’s take a look at Enterprise-D Picard. Ah, delicious Earl Grey. The “Advance” button is now gold, and on the right we see Picard’s portrait also has a gold circle “!” notification. Advanced button pressed, Picard will need a new set of items that happens to include a slightly more rare Earl Grey. At each level of advancement, Enterprise-D Picard will either need a more rare Earl Grey tea or even a new item altogether. This is true of any crew in STAR TREK TIMELINES, and so you’ll often have several Earl Grey teas or Type 2 Phasers in your inventory. Many of the most common items in the game are combined to make rarer items as well, which is another reason you’ll sometimes earn (or even want) several duplicate items. It can take quite a combinations of items to make a 3- or 5-star Earl Grey. Ship Battles are real-time conflicts between two starships and their respective crew. Before each battle, playing as Captain, you assign some of your crew to battle stations. When placed in a battle station, each crew member can be activated to temporarily increase one of the three tactical capabilities of your starship: Damage, Accuracy, or Evasion. To be victorious, Captains must choose the right crew for each respective battle, and that can change depending on whether you’re battling a Borg Cube or a Klingon Bird of Prey. Sometimes, your starship may need more damage for the heavily armored starships. And other times you may require incredible accuracy to hit more nimble vessels. In combat, you can see the full effect of ship ability by tapping and holding on a crew slot. Thanks to a successful Ship Battle, Kirk, Garak, and Vash all hit level 10. Now they’re ready for new equipment. Winning a Ship Battle earns you Captain and crew experience, including credits to spend on upgrading crew or purchasing packs from the Time Portal. Each Away Mission and Starship Battle also has three difficulty levels: Normal, Elite, and Epic. Each difficulty will increase both your challenge and rewards, and can only be unlocked by achieving 3-stars on the previous difficulty. You can earn 3-stars on Away Missions by earning all Rare Rewards. And to earn 3-stars on Starship Battles, you typically must win without losing shields or by defeating your opponent with a specific amount of time. In the Battle Arena, Captains test wits and firepower against one another in exciting player-vs-player ship battles. Looking for a new starship? Captains need the appropriate number of schematics unique to constructing each starship. Each vessel will have a required total number of schematics, varied by the ship’s rarity and overall battle power. Schematics can be obtained in item packs at the Time Portal, and also by completing various missions from Episodes. Each crew member can have up to 3 skills from the six areas of expertise: Science, Diplomacy, Engineering, Command, Medical, and Security. As Captain, you must assign three crew members to overcome each Away Mission’s skill challenge nodes  and successfully complete your mission. As you build your Away Team, any skills they posses that are required for the chosen Away Mission will cause any corresponding nodes  to be highlighted gold. Each challenge node  has an associated skill (Diplomacy, Science, etc.) By default, crew with higher skill values will increase your chances at success. However, each sequential challenge will wear down a crew member, reducing their effectiveness in subsequent challenges until they rest one turn. Spock’s skill in Science and Command is useful on three nodes, turning them gold, and making any officer with a third skill in Security or Engineering potentially more useful. If you fail the challenge on any node other than the final one, it will cause your final skill challenge to be more difficult. Overall success or failure on an Away Mission is determined at the final challenge, so try to save your best officers for the final challenge. Every Away Mission has a selection of Suggested Traits . Each crew member has their own unique collection of Traits reflecting their personality and background. These include racial associations (e.g. the Klingon Trait) as well as Traits associated with particular jobs like Pilot or Astrophysicist, and even attitudes like Innovator. Traits provide boosts on certain nodes , typically ones with Rare Rewards as noted by the star symbol  below a node. For a chance at earning a Rare Reward, your crew must have a high enough skill to achieve a critical success on the node. Once you’ve earned a Rare Reward the star symbol will disappear, noting the reward has been acquired. Geordi LaForge possess the Innovator Trait, making him very likely to unlock a Rare Reward on the first and second Engineering skill challenge nodes. Aside from Rare Rewards, completing Away Missions can earn you credits, experience, equipment, and training items. Moreover, earning all of the Rare Rewards available on a specific Away Mission will result in an award of 3 stars. As you progress through STAR TREK TIMELINES it will only become more important to balance the progression of your crew with the growing challenges of each new Episode, whether it’s Starship Battles or Away Missions. Upon winning an Away Mission you’ll often receive equipment for your crew, Captain and crew experience, Training Programs to further level-up your crew, and credits. Other rewards can include Starship Schematics and Transmissions to complete faction missions, which themselves can give the above items. There are three difficulty levels for Away Missions: Normal, Elite, and Epic. Each level presents higher skill node challenges and also better rewards. To unlock Elite and Epic difficulties, replay an Away Mission to unlock all Rare Rewards. Once you’ve earned 3-stars on an Away Mission or Starship Battle, you can return to them in the Episode screen via the Galaxy Map and use the Warp 1 and Warp 10 buttons. You can also use the Crew Management screen to tap on any empty and unlocked item slots for a list of Away Missions, Starship Battles, and Faction Missions that have an item as one of their rewards. Tapping “Warp 1” will instantly and automatically play through a 3-star Away Mission or Starship Battle one time, in the background, as if you had successfully played through it yourself. Warping costs chronitons, but in exchange you will acquire Captain experience, items, and credits. Warping will not earn your crew members any experience points, however. Warp 10 is similar to Warp 1, except it automatically plays through the Away Mission or Starship Battle 10 times in the background. Be careful, however, as Warp 10 also costs 10x the amount of chronitons that Warp 1 does. Armed with this knowledge, we hope you have many successful missions, Captain.